New Integrated Foundation Classes (2018R1) Released! 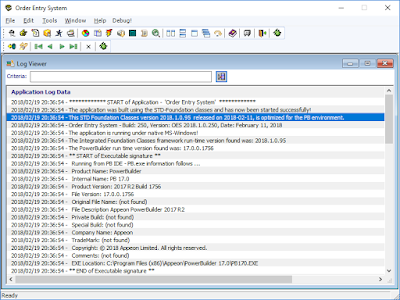 Software Tool & Die Inc (STD) are very pleased to announce that they have just released a new version 2018R1 (build 2018.1.0.95) of their Integrated Foundation Class library framework for PowerBuilder 2017R2, PowerServer 2017 Web and PowerServer 2017 Mobile! STD are also super excited as this release represents one of most significant enhancements to the Integrated framework that really exposes the power of Appeon PowerBuilder 2017R2! The new framework combined with PB2017R2 (Revision #2) really positions developers to take advantage of today's Agile and DevOps methodologies plus put a complete new GUI "punch" in your Native, Web and Mobile Apps without buying expensive add-on products. For a summary of the previous framework version's feature set, please follow this link - 2017R3. New Transaction Object Heartbeat feature! Migration of entire framework from PB2017MR01 to PB2017R2. Added new variable to indicate the App is an IWA application in "nc_app_controller_master". Revised code to set IWA switch & log status if in DEBUG mode in "nc_app_controller_master". Added new public function "of_is_iwa_app" in "nc_app_controller_master". Added new public function "of_set_dockable_mode" in "nc_app_controller_master". Added new public function "of_is_dockable_app" in "nc_app_controller_master". Added code to the RetrieveEnd event of "vs_dc_graph_master" to handle graph creates in PowerServer Web & Mobile. Added new public function "of_get_document_windows" in "nc_app_controller_master". Added new public function "of_get_tabgroup_windows" in "nc_app_controller_master". Added new public function "of_get_docked_windows" in "nc_app_controller_master". Added new public function "of_get_sheet_windows" in "nc_app_controller_master". Removed all extraneous code. Added instance Window PTR in "wn_debug_list_master". Changed code to use save Instance Window PTR in "wn_debug_list_master". Added code to resize the mle_windows control in "wn_debug_list_master". Added code to Loop through the tracked windows & list them in the MLE in "wn_debug_list_master". 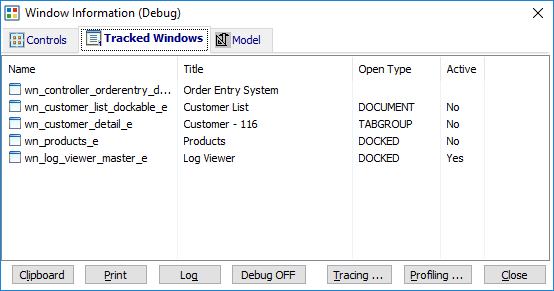 Added Trace Model tab page to "wn_debug_list_master". Revised the code to fix the report type if Sheet is also dockable in "wn_main_master" of_get_window_open_type method. Added boolean indicator for tracking being the current Active window in "wn_main_master". Added new public function "of_get_sheet_windows" in "wn_master". Added code to the Activate Event to Set Active Window indicator on focus in "wn_master". Added code to the DeActivate Event to Set the Active Window boolean to false when losing focus in "wn_master". Added code to Fix for PowerServer Web bug SelectText in "wn_messagebox_master". Revised GUI to present better on W10 & newer O/S versions in "wn_zoom_master". Added code to mark the open state as SHEET for MAIN window types being opened in "fn_open_sheet_as_document". Added code to mark the open state as SHEET for MAIN window types being opened in "fn_open_sheet_docked". Added code to mark the open state as SHEET for MAIN window types being opened in "fn_open_sheet_in_tabggroup". Added code to mark the open state as SHEET for MAIN window types being opened in "fn_open_sheet_withparm_as_document". Added code to mark the open state as SHEET for MAIN window types being opened in "fn_open_sheet_withparm_docked". Added code to mark the open state as SHEET for MAIN window types being opened in "fn_open_sheet_withparm_in_tabggroup". Moved 64bit code to the 64bit App Controller object class "nc_app_controller64_master" from "nc_app_controller_master". Added new "ns_http_client_master" base class for the new HTTPCLIENT object class. Added new "ns_json_generator_master" base class for the new JSON Generator object class. Added new "ns_json_parsor_master" base class for the new JSON Parsor object class. Added new "ns_restful_client_master" base class for the new RESTFul Client object class. Added new "of_set_transobject" method to the "ns_ds_master" object class. Added new "of_get_transobject" method to the "ns_ds_master" object class. Added new variables to support "heart beat" feature in the "ns_sqlca_master" object class. 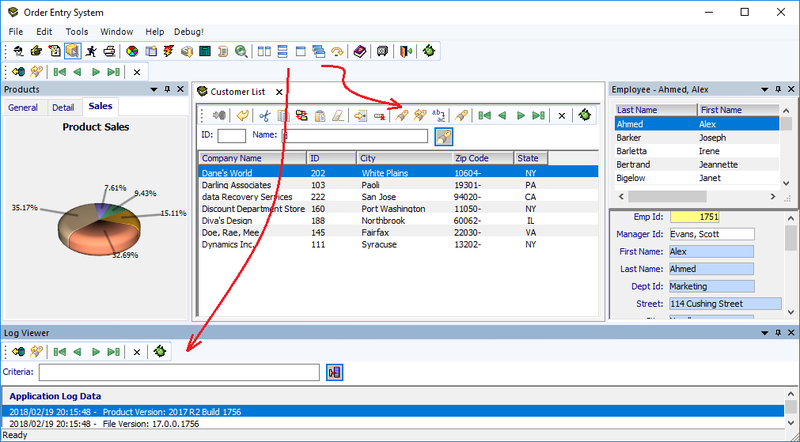 Added new "oe_heart_beat" event to the "ns_sqlca_master" object class. 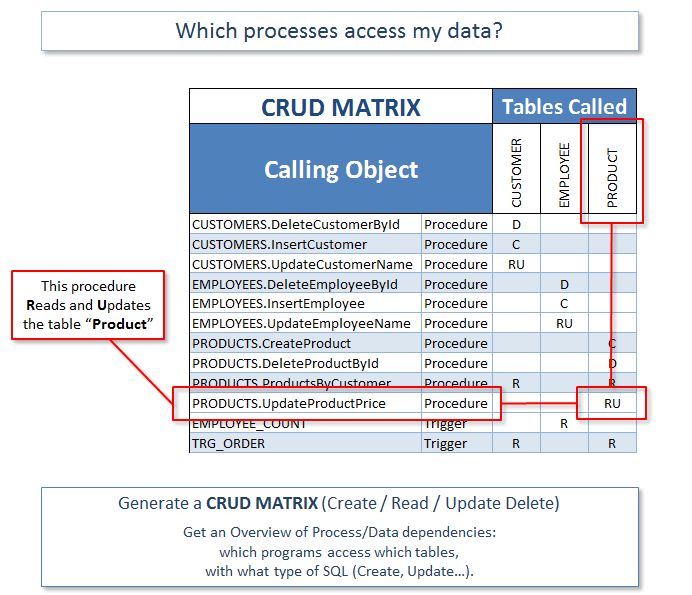 Revised the "of_Connect" and "of_disconnect" methods in "ns_sqlca_master" class for the new Heartbeat feature. 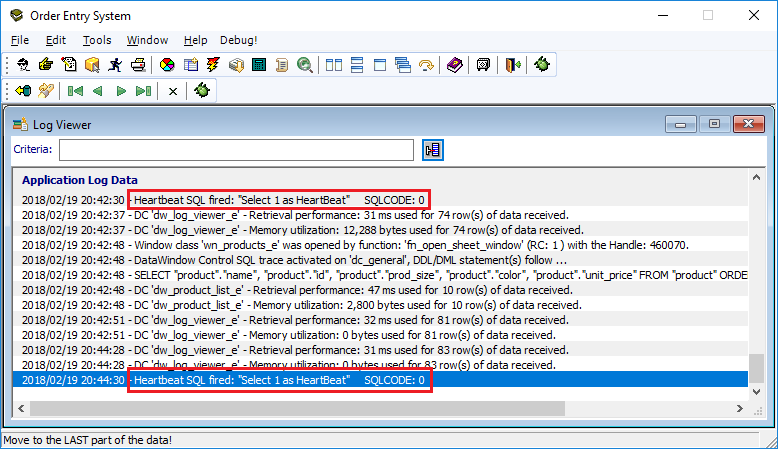 Added new "of_set_heartbeat_time" method to the "ns_sqlca_master" object class. 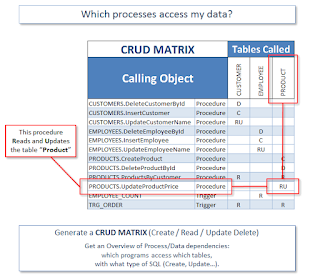 Added new "of_set_heartbeat" method to the "ns_sqlca_master" object class. 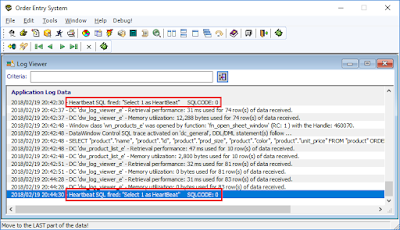 Added code to control the HeartBeat feature if active SQL is found in the SQLPreview event of "ns_sqlca_master". Added Transaction Object pointer and Get/SetTransObject methods to support Parent class pointer. Revised the "oe_resize" event code in "vs_tc_master" to fix resizing issue. Revised the "resize" event code in "wn_log_viewer_master" to fix resizing for Dockable windowed App . 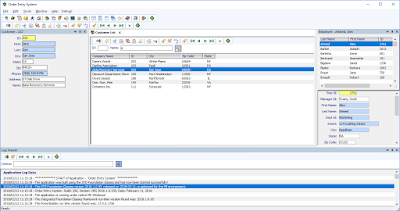 STD Integrated Framework - Updated OrderEntry Example Application! 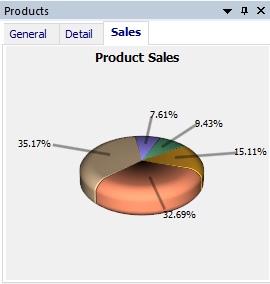 The example OrderEntry application has been built utilizing both of the Software Tool & Die Inc. frameworks. 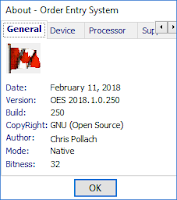 The OrderEntry application has now been updated in this latest release to use the new Integrated framework 2018R1 (build 2018.1.0.95) and the Web Service framework 2017R2 (build 2017.2.0.65). 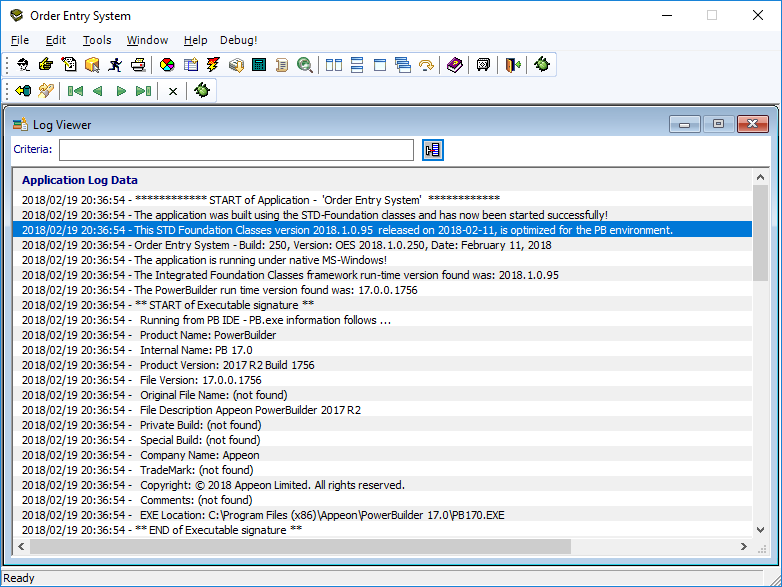 It is also the first version of the OrderEntry example application built using the new PowerBulder 2017 R2 IDE release from Appeon. New Dockable application look & feel with updated menus! 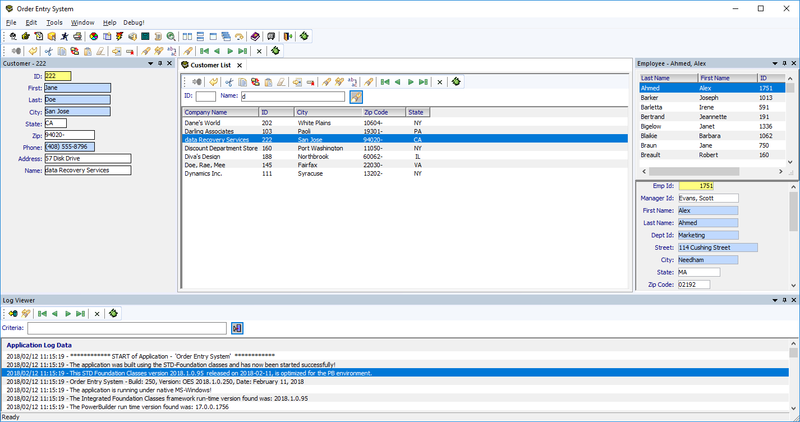 Utilizing the STD frameworks, the OrderEntry application demonstrates how PowerBuilder 2017R2 and Appeon developers can really extend the functionality of their business applications for native, cloud, web and mobile use! The example application can not only be deployed as a 32bit native, Web or Mobile App - now for the first time, also a 64bit App as well. 3D Graph rendering with colour control! Software Product Italian (SPI) Corporation will be hosting their annual seminar on March 20-21, 2018 at the Boscolo Astoria Hotel in Florence. Appeon CEO, Armeen Mazda, and Appeon MVP, Marco Meoni, will share with the attendees the updated PowerBuilder road-map and the technical details in the latest PowerBuilder R2 release. Please join SPI in Florence to have a face-to-face communication with Appeon and their local partner in Italy. For more information ... click here! Nippon Computer Systems (NCS) Corporation will host their annual PowerBuilder seminar to celebrate the release of PowerBuilder 2017 Japanese version on February 20, 2018 in Tokyo. Appeon CEO, Armeen Mazda, will share with the attendees the updated road map for PowerBuilder including the key new features of PowerBuilder 2017 R2, released on January 31, 2018. 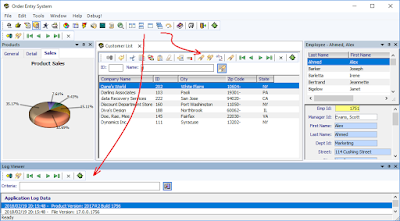 In addition, NCS also share more PowerBuilder 2017 technical details.